We used to have 1-var stats and linear regression in algebra I, probability in geometry, and polynomial regression in algebra II, but teaching everything separately felt very disjointed. Our department generally agreed with Arthur Benjamin's ideas about teaching statistics. 😒 It was a struggle for our geometry teachers to change gears at the start of the year. We found that many of the routines that work in geometry don't work as well with statistics. I have typically used a Which One Doesn't Belong to start every geometry class, but I found it very difficult to find or make ones that worked in statistics. Over time, I found that other routines such as Would you Rather, Clothesline Math, and some 3-act tasks were better suited to starting a lesson. 😁 On the other hand, students felt much more at ease as compared to previous years. 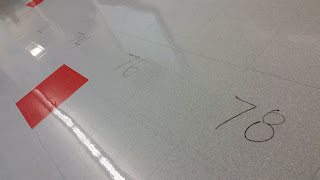 We have previously started the year with coordinate geometry, which relies heavily on skills from algebra I. I've started the year with Jo Boaler's Week of Inspirational Math for the past three years, but students that didn't fare well last year see the writing on the wall and begin to withdraw early. Starting with statistics circumvented that issue and promoted more of a growth mindset. 😃 Starting with statistics also felt natural, because at the start of the school year you're trying to learn more about your students. Those student surveys and "getting to know you" activities suddenly had more of a purpose. It felt natural to ask students what town they lived in (we're a magnet), then ask how long they rode the bus to get to school, then make a histogram of those times, and finally look at the center and spread of the data. 😏 Staying with statistics for an extended period of time let us talk about social justice issues. For example, after looking at the bus ride data we were able to have an informed discussion about the impact of magnet school busing on our students. Unfortunately, these conversations tended to be limited to one lesson. I would love to have students explore social justice issues further, but I'm not quite sure how I would go about it, if my sophomores are ready for that, or if there is enough time. 😓 Speaking of not enough time, we're now in a situation where our normal geometry curriculum is compressed by six weeks. Since the SATs don't focus on geometry, most higher-ups doesn't see an issue. However, I know that our team of geometry teachers will need to start picking and choosing what topics in geometry we can spend less time on. Wish me luck! The conclusion: the stats unit will live to see another year! "Hey everyone. 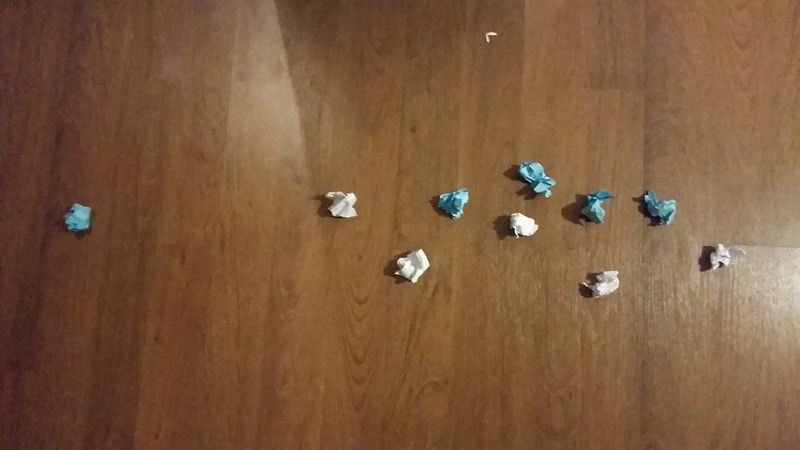 I put some marks on the floor. Try to stand in the right spot according to your height." "Oh yeah, I made these too. Figure out who should hold these. I'll just wait over here." "Can we make it look a little more 'box-plotty'? Yeah, like that. Smile!" Someone moved just before the picture. 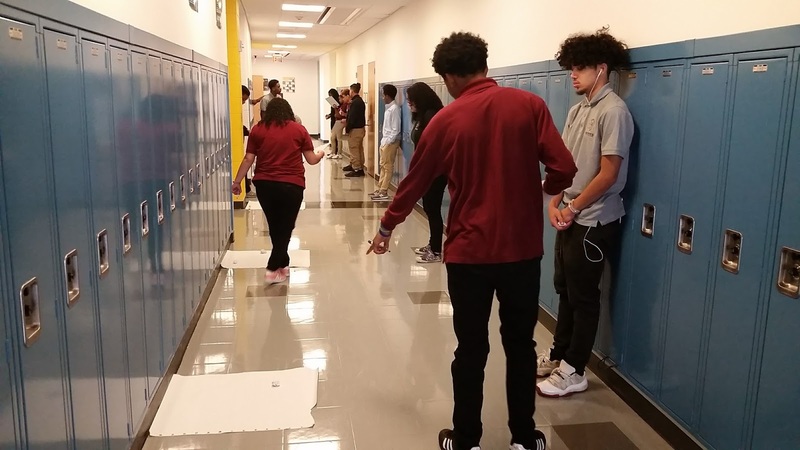 Besides this being a goofy team building activity, it provided a good reference point for students to understand how boxplots work: There should be (roughly) the same number of people in each quartile. Small quartiles don't mean there are less people with that height; it means that the same number of people are crammed into a smaller range. You can see the girls peeking through in the middle. Big quartiles don't mean there are more people with that height; it means that there are the same number of people spread out in a bigger range. Just look how much space the girl in red off to the right has! 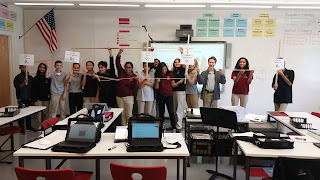 Every time a student had a misconception about box plots, I reminded them of this activity. I wanted to create some sort of mildly competitive a game that would convey the idea that standard deviation (or any measure of spread) does not depend on how high or low the average of a data set is, but on how much all of the data points vary from that average. Unfortunately, the objective of most games is to either get a high score (e.g. cup stacking challenge), or meet some other specific criteria (e.g. landing on red in roulette). 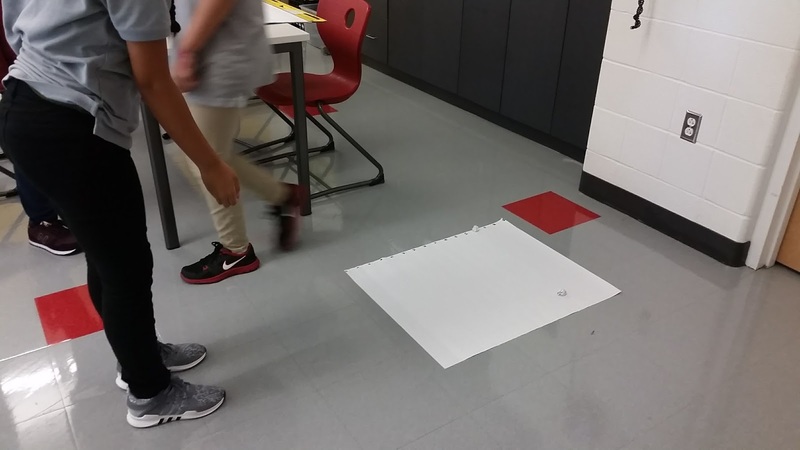 (1) Put some sort of lines on the floor so students will be able to tell how far they've tossed the balls from where they are standing. I used chart paper, but you could easily just lay a measuring tape on the floor, or count floor tiles. (2) Place the class into pairs - these pairs will be competing against each other. 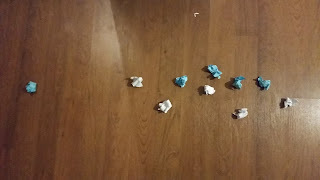 Each pair should take turns rolling 5 crumpled balls of paper onto the floor (we used ping pong balls originally, but they rolled too much). It helps if the two partners have two different colored balls. (3) The objective is to get your balls as close as possible to each other, while making your opponent's balls more spread out. You are allowed to knock your opponent's balls away from the group as you toss. (4) Once all 10 balls have been tossed, ask students to record the distance of their five balls from where they stood. If there is time, groups can play a second or third game. 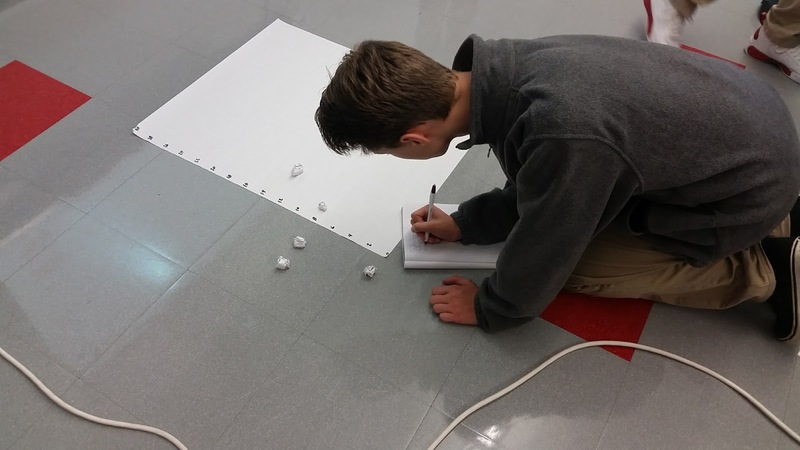 (5) Once everyone in the class had played at least one game, ask students to find the standard deviation, range, and IQR of their 5 balls from one of their games. I asked students to determine which partner won, and why. 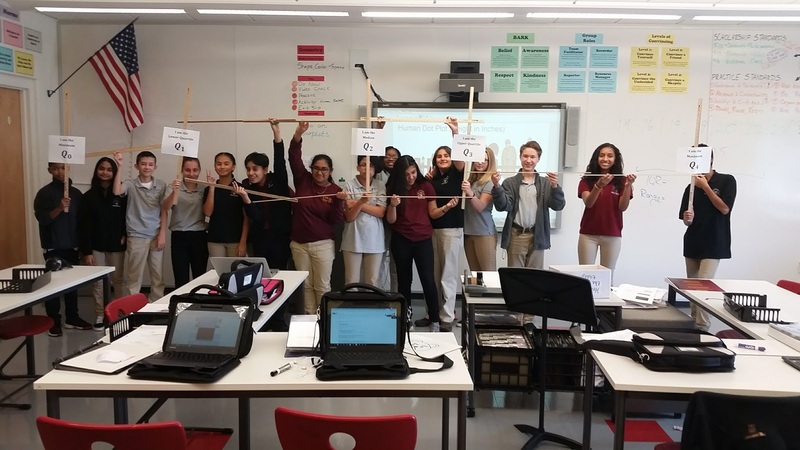 This led to a really great discussion of how we calculate all three measures of spread, what the advantages and disadvantages of each measure is, and which measure was appropriate for this game. We didn't have enough time to delve too far into a discussion, but I could see this turning into a 5-practice routine where groups need to defend which measure of spread would be best for this game. I also think this is a great way to visually see the differences between standard deviation, range, and IQR for students that have trouble calculating each. Both versions of the activity can be found here. I used this activity twice. 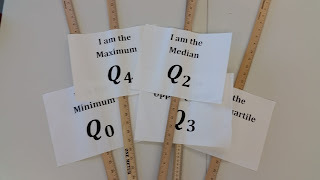 I first gave it to students before we had started the unit on measures of center and spread. I told them that there were six high school seniors that had been identified by recruiters to play for the UCONN Basketball Team. Unfortunately, there were only scholarships for two players. They had to work with their group to pick the two players using the data I gave them, and create a poster defending their choice. We followed a 5-practice routine discussion structure, and I found that their responses gave me great insight into how to navigate the next two weeks of instruction. 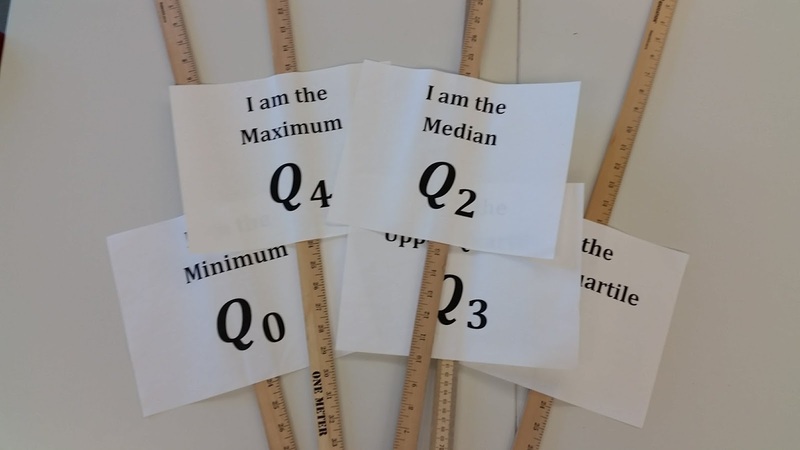 I also gave this activity to students as an assessment when we were finishing up measures of center and spread. This time, I told them that none of the prospective players got recruited. They now had to play the role of angry parent and explain to me why their son should have made the team. I assigned each group a prospective player, read through the scoring rubric, and sent them on their way. Brendan is a great player, and you should choose him, because if you remove those two outliers his average increases. He just had a couple of bad days, and those days skew the data. What happened on those days? What about the other day? I was honored to receive one of NCTM's Future Leader grants to attend NCTM this year. I strongly recommend anyone who is interested to check out their list of grants and apply here. Below are five things I learned about growth mindset and student engagement. Review the growth mindset norms, and adjust them to fit your student’s needs. Don’t be afraid to deviate from the seven norms laid out in Mathematical Mindsets if they suit your students more. Leave time to complete at least one low-floor high ceiling task per week, perhaps on each Friday. Have students complete the free YouCubed online course. Help other staff members develop their own growth mindsets and encourage them to promote a growth mindset in their classes. It can be difficult for students to get the message if you’re the only one promoting it in your school. A few ways to do this are to try low-floor high-ceiling tasks together during staff meetings, bring in student work from their own classroom tasks, or modify your lessons using the new growth mindset cards. More on this later. 2. 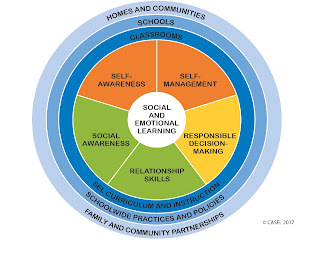 Capitalize on social and emotional competencies embedded in the SMPs: Often, we believe that the sole purpose of the Standards for Mathematical Practice is to develop mathematical dispositions and habits. 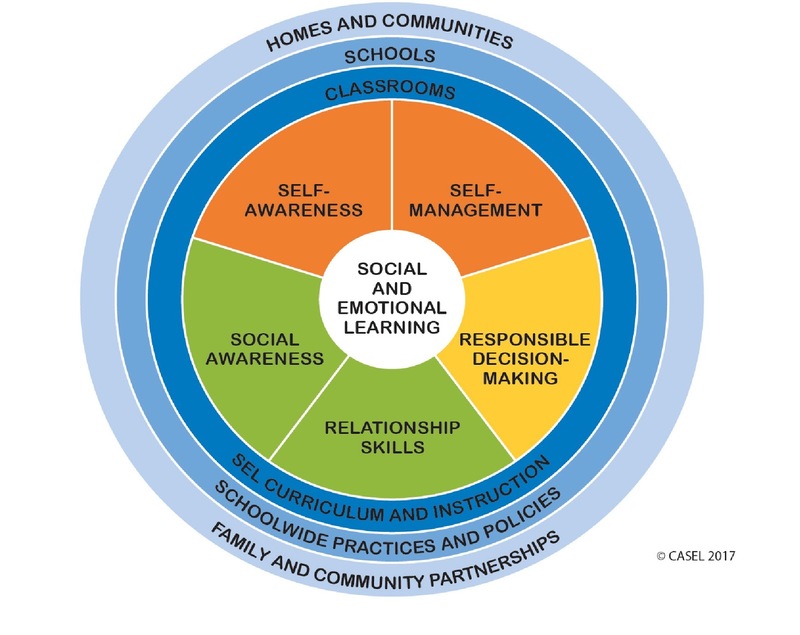 However, Aurelia Milam demonstrated that we can use the social and emotional competencies embedded within the SMPs to help our students improve their self-awareness, social awareness, decision-making, self-management, and relationship skills (NCSM 2017, Session 1720). In her session, we received a copy of the SMPs and highlighted language that we thought demonstrated opportunities for social and emotional learning. 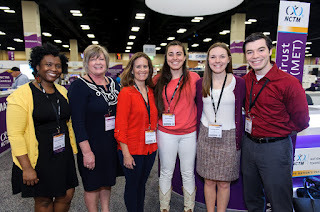 Later, we learned that two groups (University of Texas at Austin, Charles A Dana Center and the Collaborative for Academic, Social and Emotional Learning) had collaborated to create a document that explicitly describes how to integrate social and emotional learning into the CCSS. The full document is worth a read: check it out here. September: Group A wants to know if food at a local grocery store is more expensive than food at a national chain. They write their idea as a research question. October: The class studies sampling techniques, and group A is asked to collect data on prices at two different grocery stores. Other groups collect their own data. December: The class studies boxplot design, and half of the class charts the data from group A. The other half of the class charts the data from group D because they also collected one-variable data. February: The class studies two sample t-tests, and the entire class analyzes the data from group A. They determine that there is no statistical difference between prices at the two stores. June: Group A writes a letter to the local grocery store outlining their findings and presents it to the owner of the store. Other groups complete their own projects. Start early and acknowledge that some conversations might be difficult. Get your principal or administration on board by talking to them. Understand that you won’t know what projects or ideas the learners will create. Write each group’s research question, so dependent and independent variables are explicit and discussions focus on ideas and not semantics. Disagreement is okay, but listening to and respecting one another is vital. Give students time to absorb and think. Be sure to listen. It’s okay if we don’t have all of the answers. Teachers ask questions that help students focus on their thinking and identify the source of their struggle, then encourage students to look at other ways to approach the problem. Teachers encourage students to reflect on their work and support student struggle in their effort and not just in getting the correct answers. Teachers give time and help students manage their struggles through adversity and failure by not stepping in too soon or helping too much and thus take the intellectual work away from the students. Teachers acknowledge that struggle is an important part of learning and doing mathematics. 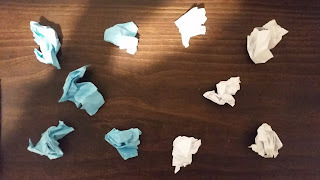 We ended the session by noting that without selecting the right task and pre-planning student questions, the whole idea of productive struggle falls apart. This is often a point of improvement for me. My classes are unleveled and include a wide variety of learners. As a result, the tasks I select and the questions I ask can fall miles above or insultingly below a student’s level of understanding. Perhaps by using more low-floor, high-ceiling tasks, I can plan a more appropriate range of questions for my next lesson. 5. 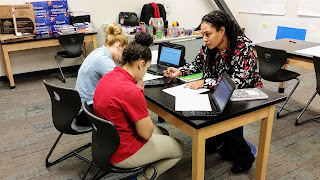 Develop a flipped self-paced mastery approach that expires within two to three weeks: I like the idea of a self-paced mastery approach, but I dislike the idea of having all of my students working on completely different topics. Nor do I like the idea of putting my students on computerized software that would differentiate for me. Instead, I wish that I could have all my students focus on the same topic, but with different levels of depth, so that they could still communicate and collaborate with each other. 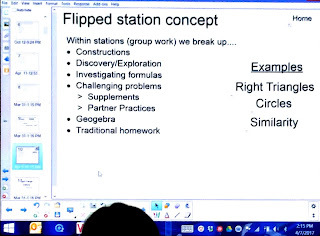 In their session titled Self-Paced Flipped Model: A Twist on Flipped Mastery, Kyle Wilhelm and Shelly Lindsey presented a framework for combining a flipped classroom model with mastery based learning. They suggest creating two to three week mini-units that include a summative assessment at the end. During the unit, students watch videos at home and spend half of their class time attempting formative assessments, reflecting, and completing independent practice. These assignments are presented in a playlist of increasing depth and complexity, and students are encouraged to get as far as they can within the playlist before the summative. 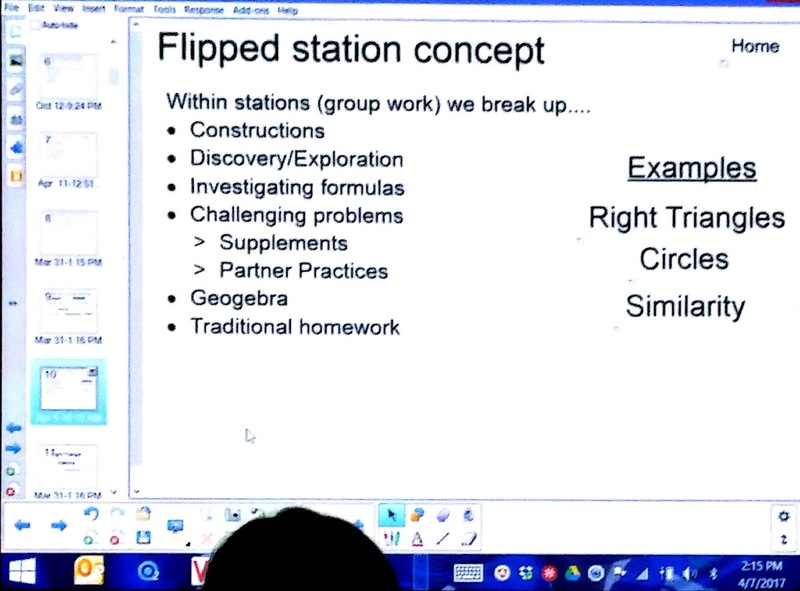 The other half of class time is spent completing group tasks or in stations designed to target the Standards for Mathematical Practice in a way that independent work cannot. The key is to develop tasks or stations that are accessible by all students, no matter what part of the playlist they are on. I like this method, but I have questions about the summative assessment at the end of each mini unit. Students that did not finish their playlist, or did not get to activities with sufficient depth, would probably not have all the skills to perform well on their assessment. Perhaps there is a way to use a scale or rubric to account for these students. 6. 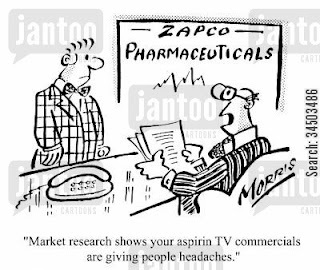 [EXTRA CREDIT] Ensure that every dose of aspirin has a headache: To be honest, it would probably be redundant and over simplistic to distill this session down into a snippet at the end of an exceptionally long blog post. So, I’ll just direct you do Dan Meyer’s post. I work as a high school math teacher and building-level team leader in an urban magnet high school in Hartford, Connecticut. Our district includes twelve semi-autonomous and rapidly growing secondary public magnet schools that are mandated to serve a culturally and economically diverse set of students. We draw students from 36 sending districts which include urban, suburban, and rural towns. Each school has a custom theme (e.g., environmental science, performing arts) and school structures vary. At one point, an attempt was made to standardize the curriculum throughout the schools using the Springboard texts from College Board, but due to the drastically different needs of each school, it was difficult to implement with fidelity. Each school is asked to preserve the structure of the units, the anchor activities, and some of the assessments we create. Yet due to the variability between schools, teachers are free to take or leave any additional resources included in the curriculum to suit the needs of their students. 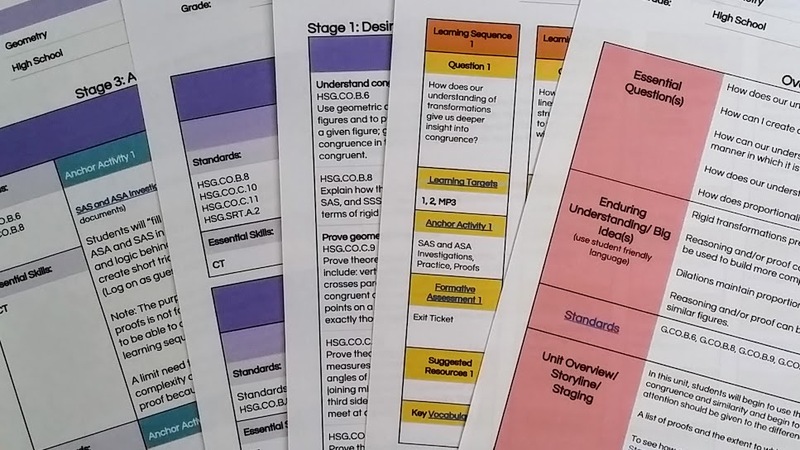 Teachers are also encouraged to leave comments on the curriculum documents throughout the year that will be used during the next summer’s revisions. Moreover, we may think all of the chapters of a textbook are Common Core-aligned, but there are often topics that don’t attend to the Major Work of each grade. By ditching the textbook, we have effectively let go of non-aligned topics and opened up more time to focus in-depth on the standards. 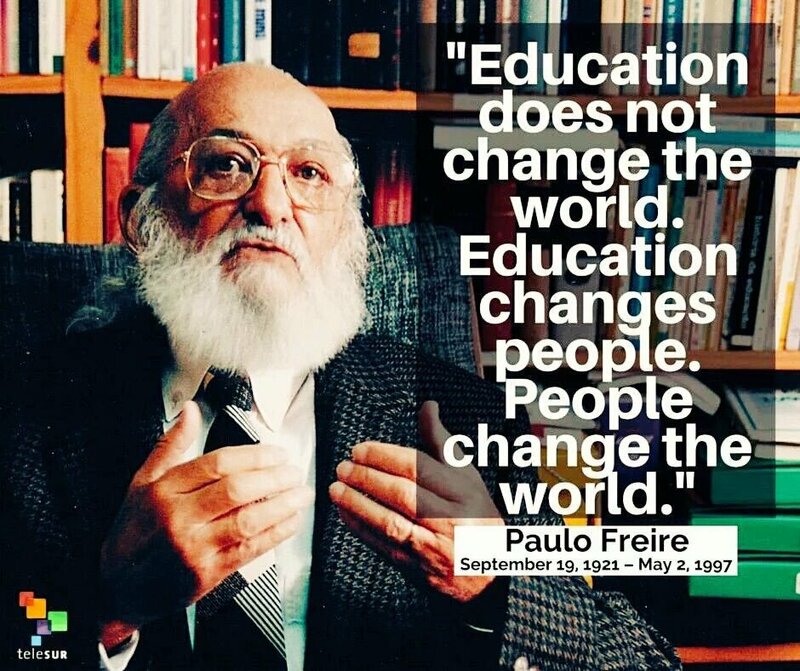 The lack of a textbook has also made my colleagues and me quicker to adapt to changes in the education landscape. Connecticut has recently adopted the revised SAT as its high school accountability measure, and by having a stronger knowledge of our curricula, we were easily able to highlight which standards were linked to the SAT and find tasks that were both SAT- and CCSS-aligned. Lastly, we’ve found that students need resources that are accessible anytime, anywhere. While you may be able to take a math book home with you, that doesn’t necessarily mean it’s accessible. By dropping the textbook, we have been able to focus on finding or creating our own tasks, applets, and online videos that are both student-centered and usable anywhere. Below are a few of our favorites. 1. 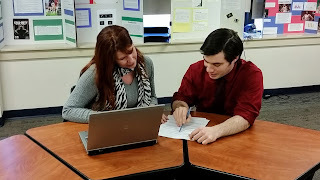 Unit plan with a buddy: Many of our smaller schools only include one teacher per course. As a result, there can be serious misalignment between years that leads to a lack of coherence. We make it a policy to plan each unit with another teacher of the previous or subsequent course. 2. 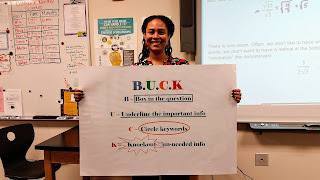 Find both a lesson structure and a unit plan template that explicitly includes time for conceptual, procedural, and application tasks: Our curriculum includes ample resources that cover all aspects of Rigor, but it can be tempting to overemphasize procedural fluency by resorting to worksheet generators or online practice. Using both unit and lesson plan templates that include explicit sections for conceptual, procedural, and application tasks reminds us to check the curricular resources or find our own, if needed.Lesson Plan. 3. Comment on the curriculum: As previously noted, we house our curriculum on a set of Google Docs that are open to comments from teachers. Without a textbook in the way, our curriculum coordinator is able to use our suggestions to make changes in the curriculum by the following year and sometimes sooner. 5. Focus less on common texts, and more on common strategies: Often, math textbooks prescribe how a topic should be taught at the start of each section. Without the guidance of a book, our discussions have shifted to designing and piloting new instructional strategies and routines to improve achievement. We are only able to try one at a time, but we are slowly making progress. 6. Help out your newbies: The learning curve for teaching without a textbook is steep; your new teachers will need you. Introduce them to the templates, lesson plan with them, share resources, and offer to let them observe your lessons. One of my colleagues recently told me that textbooks are like crutches: although they might save you some pain, you’ll never be able to truly run. I’ll take a scraped knee every once in awhile if it means I get to sprint ahead with my students. Full Disclosure: This conference was hosted by Student Achievement Partners, who graciously funded two days of meals and accommodations for the duration of the convening. 1. The Instructional Coaching Guide: Connecticut's teacher evaluation system is based largely on the Danielson Frameworks. While these rubrics are often helpful, it is entirely possible to craft a lesson that scores very highly within Danielson, but does not actually teach any mathematics. 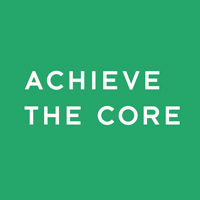 Achieve the Core's Instructional Coaching Guide emphases the idea that the three shifts (focus, coherence, and rigor) are non negotiable, but that not every instructional or mathematical practice may be observed in every lesson. To that end, the rubric may be used in parts, and there are spaces to note when a specific practice was not observed, rather than giving unnecessary negative feedback. 2. The Verdict on Time Fluency Tests (For Now): Timed fluency tests (e.g. Mad Minutes) were often used pre Common Core to determine a student's level of fluency. 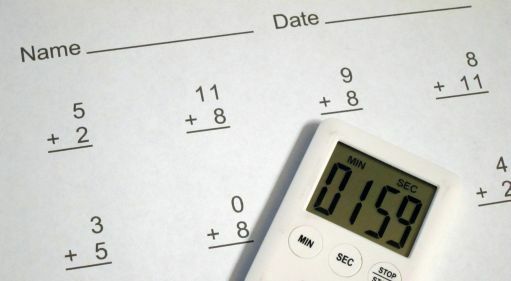 However, many critics noted that these timed tests can be damaging to a student's mathematical efficacy, and that they only reinforce the misconception that mathematics is about speed, not depth. After some debate, the conclusion I came to is best described by thinking about fluency in a foreign language. A person who is fluent in a language is able to easily access basic facts and linguistic procedures within a context. While it may sometimes be useful to test how quickly someone can recite vocabulary terms in a foreign language, the learning should be done in context. Similarly, it may be appropriate to give a student a bi-annual benchmark, but learning basic math facts should always be done in within the context of "why" and "how". Moreover, if a student is having trouble with fluency in the upper grades, the solution is to work with these facts in context as much as possible without stopping curricula to focus solely on basic facts. 3. The Coherence Map: Student Achievement Partner's Coherence map is a great way to see examples of standards aligned tasks, learn about the prerequisite knowledge for mastery of a standard, and see how each standard will be used in later grades. Unfortunately, the map does not allow a user to start at a high school standard and trace the connections backwards. The best a 9-12 teacher can do is choose a 6th, 7th or 8th grade standard and trace it upwards to see what is is connected to in high school. I had the chance to talk with Joanie Funderburk about her rational for leaving the high school standards out. 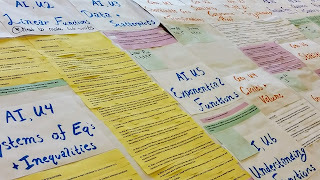 Due in part to the many interconnections between the high schools standards, and in part to the lack of priority standards, they were unable to write an algorithm that accurately captured the connections. While the explanation made sense, I left still wanting an easier way to explore the connections between the standards. She suggested I create my own map, and while I wish these resources were already available, nevertheless, I think it might be a worthwhile exercise. Another teacher suggested I check out Battelle's Vertical Progression Guide. Perhaps this is something to look into in the future. 4. 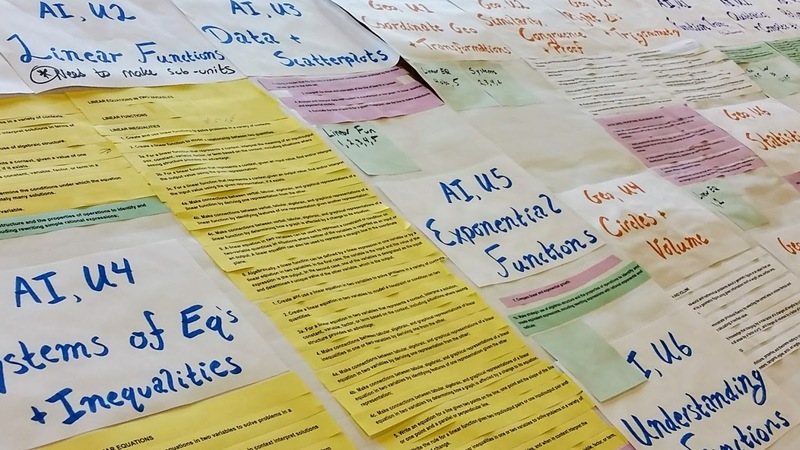 Accessibility Strategies for Mathematics: We've seen many of these strategies before, but I like the succinct layout and the ease of use that comes with this document. I couldn't seem to find it on their website, but I have copied them into my own Google Drive here. 5. The Spectrum of Higher Education: There is a wide range of possibilities for me to take as I dabble with working both in and out of the classroom. I enjoy working with and coaching my colleagues on grade level teams and within the math department, but I'm not sure how these skills would translate to a whole school instructional coaching position, or to a district wide curriculum facilitator. And, if I wanted to move in this direction, I'm not sure what educational route to use. A sixth year? Administrator certification? PhD? Ed.D? The participants at this conference gave me a great deal of information, and more to think about than I could ever hope to write here. Start - What should we begin doing at the end of this change? Stop - What should we stop doing as a result of this change? Keep - What should we continue to do at the end of this change? Tweak - What needs to be reworked or modified during this change?